One of the most tragic and strange murders in Boston history occurred on June 23, 1996. Karina Holmer, a 20-year old Swedish au pair, disappeared outside a Boston nightclub at three o'clock in the morning. Less than 12 hours later, her severed upper body was discovered in a Back Bay dumpster by a homeless person. The murder has never been solved, and remains Boston's most notorious "cold case." Karina Holmer was friendly, ambitious, and had a love of life. At her funeral in Sweden, friends and family wore colorful clothing to commemorate her joyful personality. It is a great tragedy that she was lost at such a young age, and in such a sad way. Holmer was stranded outside the nightclub Zanzibar, which was located at Boylston Place in Boston. It was reported that she was intoxicated, and her friends had left her by herself. 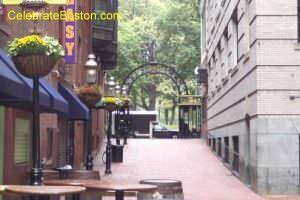 Police reports indicate that she was last seen walking up Tremont Street between Bolyston and Park Streets. Tracing the final hours of Karina's life is very difficult and strange. Witnesses initially stated that she was last seen inside a car on Boylston Street. She was serenaded by a homeless person shortly before her disappearance. She was also seen talking to a spirited nocturnal neighborhood person that morning, who eventually committed suicide. The greatest obstacle in the investigation is the absence of a crime scene; the only physical evidence is a partial fingerprint found in the garbage bag that her upper body was discovered in, and the rope marks on her neck which caused her strangulation. Eventually, more than 300 witnesses were interviewed in the case, including Holmer's employer. The employer had allowed the young nanny to stay on weekends in a studio he owned in South Boston. Holmer had dated a Boston Police Officer just before her disappearance, which added intrigue to the case. Several years later, a person was also investigated that eventually pled guilty to manslaughter and 2nd degree murder in two separate cases where the victim had been decapitated. Police concluded that none of the above witnesses were persons of interest in the nanny case. Karina Holmer wrote a poem in 1992 that was entitled "Life." She stated in part, "The richest gift you ever got is LIFE. Don't throw that away or ever step on it. But hold it high in your hands." Karina had great wisdom for her age.